Have you ever wanted to take the contents of a Google Spreadsheet and drop it right into your game project? So have I! That's why I made a tool that will take the contents of a Google Spreadsheet and turn it into a C# code file full of data! Let's say we have a spreadsheet full of data for our video game written in C#, and it looks something like this. The resulting output of that spreadsheet will be this. FailurePhrase = "Ah... well done..."
FailurePhrase = "How could you defeat me?!" I use Visual Studio, so I can only really tell you about that. It's easiest to set this up as an EXTERNAL TOOL in Visual Studio. 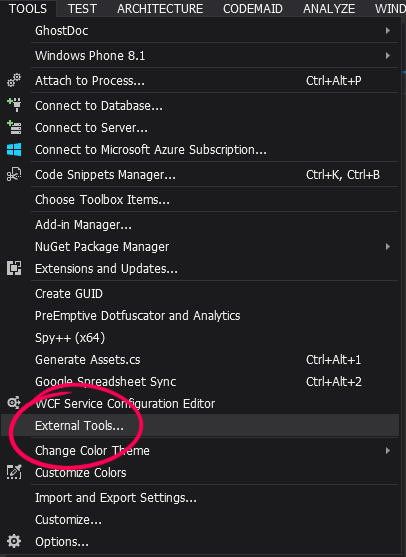 * In Visual Studio go to the Tools menu at the top, select "External Tools..."
* Name it something like "Google Spreadsheet Sync"
* For Command, press the "..." button to the right and find the exe. * For arguments you can use "$(TargetName)" "$(ProjectDir)GoogleSheet.key"
* Include the quotes in those arguments! * No quotes in that one. * Below that check the "Use Output Window" option. Before you run it though you're going to need to create a GoogleSheet.key file. That file should only contain google spreadsheet key. You should be all set to now run it from Visual Studio! It should appear in your Tools menu. You can even set a keyboard shortcut for it later if you want. 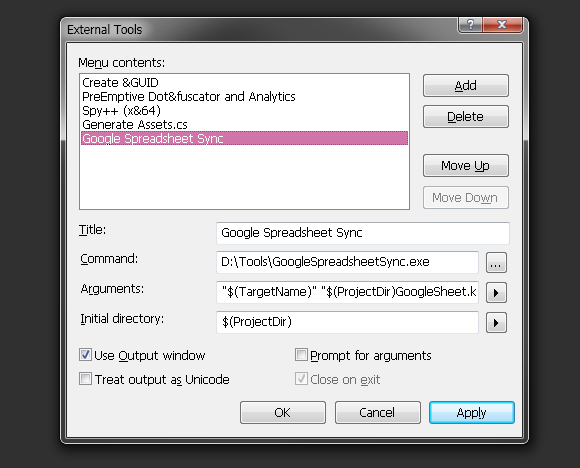 Run the tool from the Tools menu and what should happen is a Sheets.cs file is generated with all the data from your spreadsheets. Of course it would be way better if you're able to take this tool and craft it into your own needs, so here's the source code! I've started a public repository where I'll keep any useful tools I create right here. If you run into any trouble feel free to post a comment and I'll try to help! Or you can reach me at hi@kpulv.com, or the contact form at the bottom of my site.